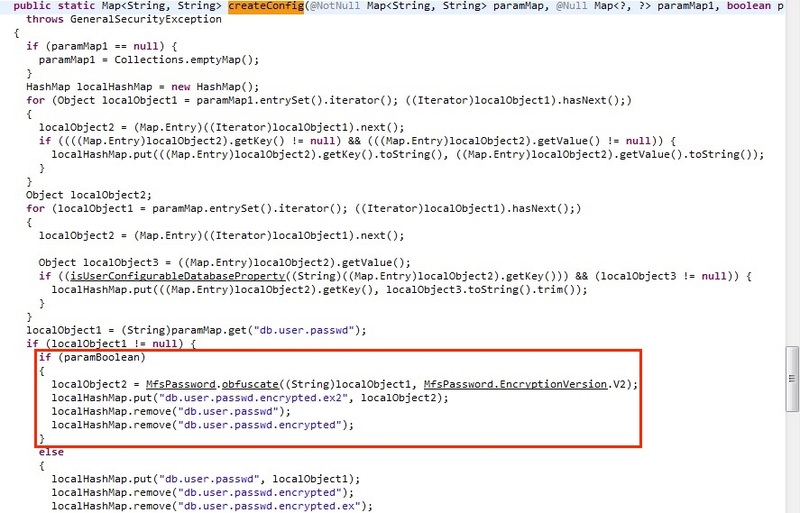 Back in 2011, a community-submitted module was pulled into the Metasploit Framework that was able to decrypt the passwords in files such as db.properties, containing the necessary credentials to connect to the database driving ePO. The module details the existence of a static key, used in conjunction with AES-128-ECB, that provides crypto services for strings in the ePO installation. It does not, however, tell us how we can find it ourselves. During a recent pentest, a co-worker tried this module against the latest version (ePO 5.3.0 as of writing) to no avail. With access to the database, one could reset or add a user in order to modify agent configurations, enabling distributed compromise on an enterprise scale. This post details the added “crypto” code, where the original author found the static key, and how the credentials can still be decrypted today. I noticed that changing the password to something else using the standard authentication configuration tool located at https://win-victim:8443/core/config-auth and back again did not alter the ciphertext in any way. 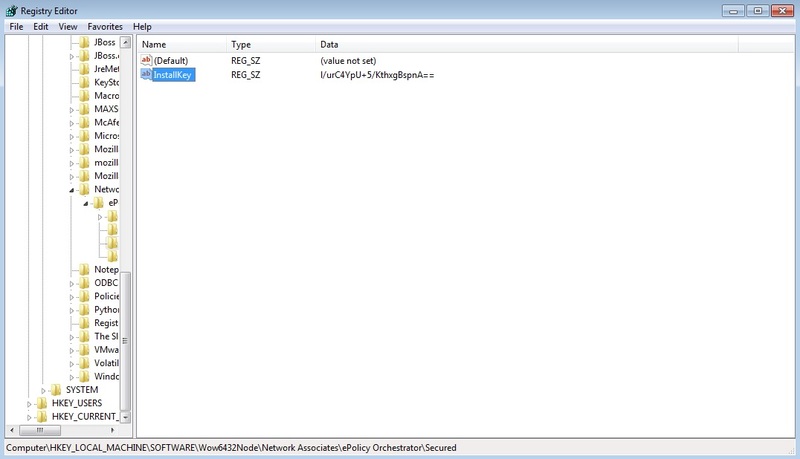 This meant that, while the key now changes among installations, it is still static per-install. After a long tour of the filesystem, I determined that our JAR of choice was orion-core-common.jar, located by default at C:\Program Files (x86)\McAfee\ePolicy Orchestrator\Server\lib\orion-core-common.jar. After searching around the JAR for a while, I wound up at the createConfig function located in the DatabaseUtil class as part of the com.mcafee.orion.core.db.base package. This function is called whenever the password is changed. Note the single call to MfsPassword.obfuscate (Seems the McAfee developers also noted the real nature of the “encryption”), passing in a single object and version of encryption to use. By following the call, we notice an interesting getKeyStuff function. Following the getKeyStuff function, we note the number of versions available. Perhaps version 1 of this function contains the static key mentioned in the Metasploit module? Let’s take a look at the MfsPassword class definition. Well, they were right, the key was hardcoded. This is version 1 code, though. Surely version 2 would be much more secure? Let’s take a look at getDefaultKeyStuff. That looks like a promising location, lets see what it does with that value. So, it looks like it just base64 decodes the value and (not pictured) returns right after. Let’s see if this value fits as a possible AES-128-EBC key. 16 bytes would fit as a drop in. Let’s take our encrypted password from db.properties and drop into a new file that can be consumed by openssl. Then we’ll try to use the key we found in the registry to decrypt using AES-128-EBC. This post will be updated when I (hopefully) get a PR into Metasploit. Happy hunting!